From Prosumer's Choice comes a practical addition to your home entertainment center. This user-friendly TV riser and swiveling stand is ready to use out of the box and holds even large flat screen TVs that measure 60" or more. The sturdy steel ball bearing design provides a smooth 360-degree rotation with a simple touch of a few fingers so you can enjoy your shows when you're not at an ideal viewing angle and have quick access to the inputs in the back of your TV. The Prosumer's Choice's rotating TV stand is made from highly sustainable, organic bamboo, not pressed particle board, so it's naturally beautiful and eco-friendly. Bamboo is sturdy, yet not heavy or cumbersome, and the attractive vertical grain finish blends nicely into room interiors. Non-skid, non-scratch rubber feet will keep even big screen TVs steady during rotation and no tools are required for assembly. Simply take the stand out of the box and place it in your home theater cabinet, credenza, desk, or other hard surface and you're ready to enjoy. 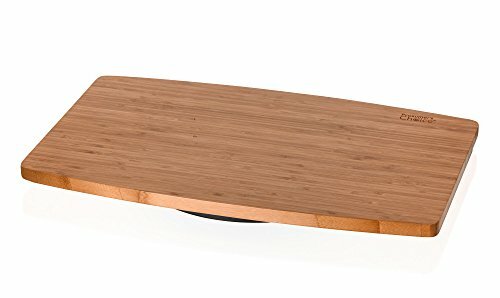 - MADE OF NATURAL BAMBOO: An eco-friendly bamboo TV stand that is naturally beautiful and certified by the FSC (Forest Stewardship Council) as 100% natural bamboo harvested according to forestry standards from sustainably and responsibly managed plantations that support healthy eco system. - STURDY CONSTRUCTION: Made of sturdy bamboo with an attractive finish that blends easily into any room décor, an attractive and practical TV stand and shelf that keep screens steady and easy to maneuver. Warranty We warrant the product against defects in material and workmanship under normal use of the product for one year for new product and ninety days for refurbished product from the date of original retail purchase. During this warranty period, if a defect arises in the product, contact our service team for instructions to return the product. We will at our option, to the extent permitted by law, either (i) repair the product using either new or refurbished parts or (ii) replace the product with a new or refurbished product that is equivalent to the product to be replaced. This limited warranty applies, to the extent permitted by law, to any repair, replacement part or product for the remainder of the original warranty period or for ninety days, whichever is longer. This limited warranty does not include service to repair damage from improper installation, accident, disaster, misuse, abuse or modifications to the product or by any other cause unrelated to defective materials or workmanship.